No sooner do I seem to start the preparation and planning for another Bristol Italian AutoMoto Festival (BIAMF) and it has passed. A great saving grace is the fact that each year more people become aware of what is now considered ‘One of the best Italian motor festivals in the country’. This year saw the passing of the 8th BIAMF and this growing support from the public and participants alike made BIAMF 2010 a successo grande, as they say in Italian. For those who have not been able to make the show, the BIAMF is an event for Italian vehicle enthusiasts organised by local members of the Ducati Owners Club and the Italian AutoMoto Club. Focussed around Corn Street in Bristol's Italianate City Centre, the bikes and cars are parked 'Latin Style' lining the streets of the show. The Festival makes for a grand day out just looking at all the exciting vehicles, chatting with the owners and making new friends. On top of that the venue has endless opportunities. Nearby there are all the shops and stalls making up St Nicholas Market and then just a short walk away and you can enjoy the Historic Harbour, Brunel's 'SS Great Britain' and the replica of John Cabot's sailing ship 'Matthew' in which he beat Columbus to North America. And of course there is Cabot Circus, Bristol's new £500m shopping development, providing visitors with over 120 new shops, including 15 major flagship stores. In an effort to emphasise the growing popularity of the show and the growing support from other marques, we enable two marques to take a prominent role as a ‘Featured Marque’ each year. This year Aprilia was the featured motorcycle Marque (who have achieved over 40 World Championships in their relatively short history), with Alfa Romeo being the featured Car Marque (in honour of the centenary of one of the best-loved makes in the history of motoring). Like the last few years the weather in the run-up to this years show was great. This was reflected in the growing numbers asking to bring their vehicles to the show. Due to the make up of the show cars need to be pre-booked and from my discussions with Paul it seems that the majority of these spaces were taken by the early part of the year. However from a bike point of view attendance is more weather dependant, with many not wanting to bring and ride their ‘pride & joy’ through a barrage of April showers. Not that this was going to be an issue this year, and as a result we saw an outstanding number of people stating that they would be coming to show their support of the festival and take part in the Festival ‘Ride-In’. It seems that the ‘Ride-In’ has now almost become an event in itself. People seem to gather all over the country to arrange their own little rides to Gordano Services, with many making arrangements as early as last years show. With some getting to the services nice and early to catch up with old friends and acquaintances made at past BIAMF ride-ins. As I pulled into Gordano services I was amazed to see that there was already a substantial gathering forming. And by the time of leaving for the Ride-In we had over 300 Italian motorcycles taking part, everything from old classic Moto-Morinis through to brand new Aprilia RSV4s and Ducati Desmocedicis. A truly outstanding sight to see as they all left and snaked their way to the heart of Bristol, with Aprilia leading the way as the featured Marque. By 10am we were pulling into the heart of Bristol, and for those really wishing to enjoy the full impact of the ride-in I would strongly encourage you to be stood outside the Hippodrome ready to watch and hear as the city rumbles to its foundations as these great Italian motorcycles growl into place at the show. It is a sight to be seen as well as heard and felt. Many a visitor and participant has stated how this arrival marks a truly majestic start of the festival. With the Festival now started spectators, owners and enthusiasts alike get a chance to mingle and chat about their own favourite cars and bikes in the most charismatic, multi-million pound parking lot the West Country will experience all year. As always there was an amazing line-up from the biking community with every imaginable Marque in presence; Moto-Guzzi, MV Agusta, Aprilia, Ducati, Benelli, Moto Morini, Laverda and Gileras. The list just goes on and on. Aprilia certainly didn’t shy away from their role of Featured Marque this year. We were blessed with fine examples from across their entire range with Tuonos, Falcos, Caponords, Tauregs, and an amazing F1 Futura. Of course we could not forget to mention that this year also saw the Marque’s switch of attention in their flagship superbike from the RSVR to the all new RSV4. The RSVR has been an amazing bike ever since its first introduction to the motorcycle market, this was highlighted by Troy Corser taking the bike to several World Superbike race wins throughout the 2000 and 2001 race seasons. The all new Aprilia RSV4 looks to be an amazing and highly deserving replacement for the RSVR. 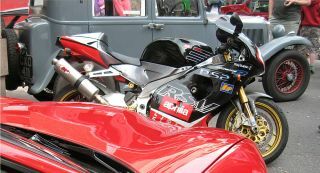 Many already have the bike down as the best sportsbike of 2010 mainly due to benchmarks it sets for engine and chassis performance both on the road and in the world’s Superbike arenas. Aprilia were also supported in their attendance and role as featured marque by ‘Aprilia Performance’ an after market Support and Service Company. They provide a full range of Aprilia services from engine work, through to suspension modifications and servicing. They also provide great facilities in race preparations, tuning (and even big bore installations). MV Augusta provided exotica in the form of the beautiful Brutales and F4’s (including a gorgeous F4 312R) as well as classics in the form of 125 sports, 750s Magni, 750ss. Ducati provided an array of everything from the classic monster, through to every possible example of each bike made by the prestigious Italian marque. Including some of my favourites of a white Casey Stoner Desmocedici RR, a blue and silver NCR’esque Ducati Sport Classic 1000s, and a beautiful SP5. Moto-Morini were also in attendance presenting us with prime examples of their Marque with a Tresette, Corsaro, 3 ½, 250 Turismo, 350, and a Dart. Moto-Guzzi also put on a strong display providing the best of both old and new. Brand new were the 1200 Sport 4V, a 1200 4V Stelvio, and a Griso SE. And people were just as fascinated by the classic bikes brought to the show. We were also very pleased to see an outstanding display from the Benelli Owners Club who brought along 12 of their beautiful bikes made up of 1 Benelli TNT Titanium, 7 Benelli Tornado TREs and 1 Tornado TRE LE. There was also 3 classic, 6 cylinder SEi models as well. A great showing that we hope is bettered again next year. Of course let us not forget the great support always afforded to us, and the show, by the Bristol MODs and Somerset Scooter clubs. Again they had their ever-popular presence of their classic retro scooters of all shapes, sizes and colours. And so with the sun still shining, bouncing off of the glossy paint and chrome finishes, we got to enjoy an amazing visual barrage for the eyes disrupted only by the morning and afternoon “Start your engines” sessions. These sessions allowed for all around to enjoy the melodic sounds of the Italian exotica present as the 'Old City' shook to the sounds of pent-up horsepower, unleashed for the joyous appreciation of the owners and spectators alike. So all in all a great festival was had by all, with the great opportunity to meet friends old and new where we could all collectively enjoy that which had brought us all together; the passion, flare, and amazing attention to detail that makes these great Italian vehicles.